Warning: Please be extremely careful deleting keys from ADSI Edit – if it goes badly wrong, you’re looking at an Active Directory restore! An Exchange 2003 to Exchange 2010 upgrade. Alas, the Microsoft Exchange 2003 Best Practice Analyzer Permission Check has not been run in which case a critical issue regards ‘Permissions inheritance block on Administrative Group object’ would have been noticed. The install completes all okay and the server is rebooted. Then we create a New Public Folder Database using the EMC (leave unchecked the ‘Mount this Database’) which completes all okay. And mount it manually without any error. Very odd because the install had correctly created both connectors (from Exchange 2003 to 2010 and 2010 to 2003) as seen in Exchange Server Manager (can also use Get-RoutingGroupConnector from the EMS). Active Directory operation failed on ... This error is not retriable. Additional information: Directory object not found. 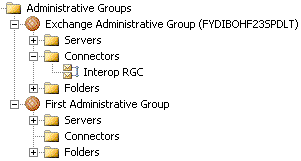 When we check in Exchange System Manager, the ‘Interop RGC’ connector has been created in the Exchange 2010 administrative group, but delivery still does not work from Exchange 2010 to 2003. Setup couldn't read the legacy administrative group 'First Administrative Group' from Active Directory, and now Setup can't continue. Check Active Directory to verify that the administrative group exists and that the user account that is running has permissions to access this administrative group. This hints at what will be the solution! In the Exchange 2010 Public Folder Management Console we are getting the following error when we try to open up the Default Public Folders and a similar one for ‘\NON_IPM_SUBTREE’ when we click on System Public Folders. No existing ‘PublicFolder’ matches the following Identity: ‘\’. Make sure that you specified the correct ‘PublicFolder’ Identity and that you have the necessary permissions to view ‘PublicFolder’. It was running the command ‘get-publicfolder –getchildren –identity ‘\’ –server ‘EXCH10.ad.priv’’. There are no Public Stores which do not have a replica of this folder. In Exchange System Manager, right-click the ‘First Administrative Group’, select properties, select the Security tab, click on Advanced and check the box to ‘Allow inheritable permissions for the parent to propagate…’, click OK to the ‘The inherited items will not show up until you close and re-open the property sheet’, and click OK again. Note: The Security tab only appears after the REG_DWORD with a value of 1 is added to the HKCU\Software\Microsoft\Exchange\EXAdmin key in the registry on the computer running Exchange System Manager. After making this change, the connectors will now create without error and mail flow from Exchange 2010 to Exchange 2003 will work! And there is a similar error for \NON_IPM_SUBREE when clicking on System Public Folders. 1) Dismount what was the newly created public folder in Exchange 2010. 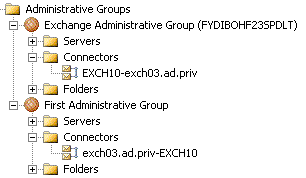 3) Use ADSI Edit to delete the second CN=Folder Hierarchies key which is found in the new Exchange 2010 Administrative Group. 4) Now simply recreate the Exchange 2010 Public Folder. The theory behind what happened with the Public Folders, is that – due to the permissions issue – when the Exchange 2010 install failed to properly create a public folder, by re-creating the public folder (from ‘Third Error’ above) this caused a second CN=Folder Hierarchies key to be created. 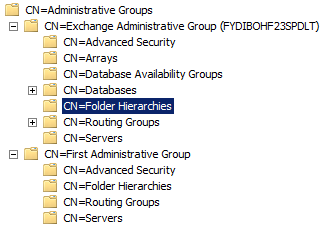 To solve all the problems, the permissions had to be fixed, and the erroneous second CN=Folder Hierarchies key had to be deleted from the new Exchange 2010 Administrative Group. More specifically, regards the ‘Multiple MAPI public folder trees’ error; this is caused by the presence of two keys with the msExchPFTreeType value of 1. 1. In ADSIEDIT, right-click on the CN=Configuration,DC=,DC=com container, choose Properties. 3. Drop to DOS and run: LDIFDE -f c:\Config.txt -d "distinguishedName of CN=Configuration,DC=domain,DC=com"
4. Search c:\config.txt for all instances of "msExchPFTreeType" with a value of "1"
In this scenario, the msExchPFTreeType existed within the second erroneously created CN=Folder Hierarchies. And all because an Exchange 2003 BPA Permissions check was not run before installing Exchange 2010! Very nice explained and helpful! Nice piece of information.While working in Exchange environment these errors are commonly faced by the user.There are several kind of errors faced by user such as system related errors,Version store related errors,Logging/Recovery related errors & JET server errors etc.The most common reason for Exchange errors is Exchange database corruption.So, its a good practise to take regular backups and perform maintenance tasks.If still corruption occurs then,run Eseutil & Isinteg utilities in repair mode to recover corrupt EDB database. Nice post. Several such Exchange errors render the database inaccessible. To deal with such errors it is is required to maintain an updated backup fr future purpose or use a good third party utility. For a small level of corruption or damage to the database ESEUTIL and ISINTEG would suffice. However, serious corruption might need a stronger solution. I have used Stellar Phoenix Mailbox Exchange Server Recovery. There are many such powerful tools available to aid Exchange users. Easily repair Exchange EDB mailbox database with best Exchange mailbox repair software. It is better to opt Exchange server recovery program to fix EDB errors and read EDB file data. MS Exchange EDB export to PST utility is effective to open Exchange database in Outlook PST file format within less time. Note: The Security tab only appears after the REG_DWORD "ShowSecurityPage" with a value of 1 is added to the HKCU\Software\Microsoft\Exchange\EXAdmin key in the registry on the computer running Exchange System Manager.